10-30% discount & BUY 3 PAY FOR 2, valid for all paintings until the 23rd of April. We deliver art that is beyond the usual! These colourful sculptures from Ocean Sole are handmade from recycled flip-flop sandals collected from the beaches of Kenya. At Art Storehouse you can buy unique paintings online with designs within both abstract art and figurative art. The artworks that we sell are mainly hand painted in various techniques, like for example oil paintings, acrylic paintings and watercolour paintings in modern and colourful designs. We also have a lot paintings made with mixed techniques. We believe that it shall be simple to buy art and paintings online. That is why our acrylic- and oil paintings are delivered stretched on a wooden frame, ready to hang on the wall. No additional fees are added for shipping or payment methods when you buy paintings online from Art Storehouse. The price that you see on the painting, is also the price that you will pay for the painting at checkout. When you decorate your home you might easily forget about making your walls beautiful as well. At Art Storehouse you can not only buy big paintings for your living room but also paintings for your kitchen or perhaps a beautiful watercolor painting for your bedroom. Our Metal Art pictures you can even have outdoors since they are completely made out of metal and other rough components. We also sell sculptures in various colours made out of recycled flip-flop sandals. This is a cooperation that we have with a small group of artists based in Kenya. They call themselves Oceansole and they act to save the worlds oceans under the motto #Fliptheflop. To buy big paintings and art online have never been easier. Buy a painting from us and we deliver it ready to hang without the need of any further framing. Unique canvases, paintings, posters and beautiful pictures from Art Storehouse makes your home more personal. Paintings is an easy and simple way to renew your decorations and create some more energy to your space. We have a grand selection of paintings to astonishing prices – welcome on a Vernissage Online. At Art Storehouse you can buy very big paintings as well as smaller paintings, all to a very affordable price. Do what thousands of pleased customers already did; buy unique paintings for your walls, at home or in the office. Handcrafted art have so much more charm to it – Just Art by Artists. My Lion is very good, it is just amazing how it was once flip flops. My husband thinks it is really nice which in itself is a real compliment as he does not like ornaments. Here you find a selection of collages with unique designs. Hand-made art that adds colour to your home. We have artworks of abstract art and modern art. Buy a collage online to an affordable price with quick delivery. Here you find a wide selection of unique sculptures. High quality modern art to add colour to your home. Sculptures from Ocean Sole of elephants and lions and sculptures of people, dogs and much more. Buy sculptures online to an affordable price with quick delivery. Here you find a wide selection of canvas prints with unique designs. Canvas art and art prints to add colour to your walls. We have a lot of pictures of world maps, cities, abstract art, modern art and much more. Buy canvas prints online to an affordable price with quick delivery. Here you find a wide selection of unique Metal Art. High quality art with 3D-effect, created completely in metal and components. Metal artworks of people, cars, boats, world maps and much more. Buy Metal Art online to an affordable price with quick delivery. Here you find a wide selection of posters with unique designs. Beautiful posters to decorate your walls. We have thousands of pictures of world maps, cities, abstract art, people and much more. Buy posters online to an affordable price with quick delivery. Here you find a wide selection of photo art with unique designs. Black and white photography and colour photos to decorate your walls. We have a lot of artworks of people, cities, naturs, vehicles, animals and much more. Buy photo art online to an affordable price with quick delivery. Here you find a wide selection of aquarelles and watercolour paintings with beautiful designs. Hand-painted art that adds colour to your home. We have many paintings of world maps, cities, abstract art, people and much more. Buy aquarelles online to an affordable price with quick delivery. Here you find a wide selection of oil paintings and acrylic paintings with unique designs. Hand-painted art that adds colour to your home. We have thousands of paintings of people, cities, abstract art, modern art and much more. Buy oil paintings online to an affordable price with quick delivery. just slightly over time. When you create an oil painting you rarely or never apply thick layers of paint. Acrylic paintings are very similar to oil paintings in the sense that the color is also not transparent on these types of paintings. It differs in the way that the colors will not fade over time and it will never get the slight yellow tone as an oil painting might. The main advantage that our artists find working with acrylic when creating our paintings is that it is very easy to create a painting with thick layers of paint, this creates a very nice effect and depth in the painting. Aquarelle is a technique for paintings based upon watercolor, it is transparent in the way that you can see the paper through the paint. You often combine aquarelle with sketching with a pencil. 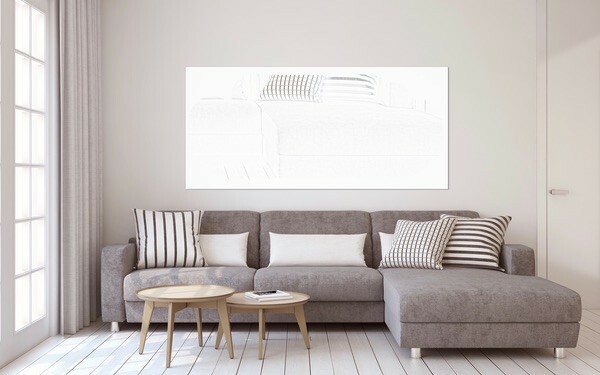 Art print, photography or graphics is an artwork that have been produced by printing on various materials with the purpose to have an artistic expression, so this is basically not paintings. Art print also comprises artworks that have been digitally made. Mixed techniques are a picture art that combines several different techniques, e.g. a painting in acrylic and aquarelle. Metal Art and Sculptures are 3-dimensional artworks of different shapes and sizes. It comprises everything from classical sculptures to modern installations. Wondering how our paintings will look in your home? Try one of our pictures or upload a picture of your own home and start to fit different paintings into the picture. You can also use our studio pictures to see how a painting will look on the wall in various environments. Are you looking for new paintings to a living room, bedroom or kitchen. Now you can find a beautiful painting from us and simply “place it” on your wall in our photostudio. You then get a very good view of how the colors from the painting matches the colors of the interior that you have in your home. So try out our photo studio and buy paintings online. Fast, safe and simple – buy your new paintings from us at Art Storehouse.